I’ve already mentioned how Planning in Management is influenced by concepts devised in the Military. It’s natural, therefore, that today we usually divide Planning into three analytical levels with a strong military flavor: Operational, Tactical and Strategic (a clear example of a classical proverb that in the Military everything consists of three parts :-)). Despite the fact that all these levels are defined pretty clearly (Strategic – where are we going? Tactical – what are we doing to get where we’re going? Operational – how are we doing it? ), there still seems to be some confusion in the eyes of many Managers. You see, in the Military the meanings of these concepts are somewhat different from the ones we’re using in the Business world. Let’s consider this difference while drawing some meaningful parallels to what we might encounter in our everyday work. Technological level – the properties and the abilities of the physical equipment, including personnel. Business example: new operating system is installed on computers inside the organization; staff is trained in its use. Tactical level – the utilization of the equipment in the physical environment; “erosion by friction”. Business example: discovered bugs in the software need to be dealt with; people have difficulties with using the software even after training; all that leads to delays. Operational level – interaction of own actions and plans with those of the adversary. Business example: clients are unhappy with delays; competitors try to take over the client base – there is a need to salvage the situation. 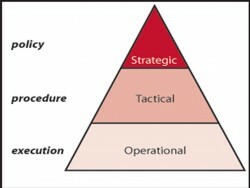 Strategic level – the submission of all actions and plans to clear goals. Business example: decision needs to be made: to return to previous system in order to quickly repair the situation or to try dealing with the problem directly by upgrading hardware/updating software/having better training. There are two conflicting goals here: immediate effectiveness and conservatism vs. long-term efficiency and innovation. Grand Strategy – the submission of all goals to a distinctive policy. Business example: the organization’s preferred policy is one of innovation – decisions are made accordingly to deal with the situation. It’s obvious that the main differences between the Business and the Military models are in regards to the Tactical and the Operational levels – their order and meaning is almost linearly reversed. The actual motive behind this difference is language-based. While we regard the Operational level as one that deals with everyday operation of the equipment by the staff, in Military it deals with whole codenamed entities called “military operations“, such as “Desert Storm” or “Market Garden”. So how can these differences be bridged, in order for us to have a better understanding of the subject? The most important thing we have to understand is that people in uniform tend to regard these levels more like LEVELS OF FUNCTIONING than LEVELS OF PLANNING. This is because the combat environment is frequently so unpredictable that it makes precise planning meaningless, while proper functioning of the system can let it survive even a completely unexpected contingency. To my opinion, this message is as relevant to us as it is to them, especially in today’s context . It reminds us that the differentiation of analytical levels doesn’t exist solely for the purpose of populating managerial positions, but to allow the agile maneuvering of our bulky organizations in the vast ocean of Business. Therefore there is a place to integrate the perception of the issue in two worlds into a common understanding. Technological level – (tools) basic constraints of technical performance, i.e. scheduling system that does synchronization once a day with other systems like payroll. Operational level (tools + people) – having a human factor in the equation, literally the operators of the system who enter the data, maintain the system, look after the materials, stock the balance or ensure that a new upgrade is running flawlessly. Tactical level (previous + friction put by constraints and play of interests external to domain) – having a portfolio of projects can help you when there’s a need to allocate resources for multiple projects, while securing an overall gain from the variety of initiatives. Strategic level (previous + friction through interaction with sources external to organization) – minding the competitors in the same niche of the market. Grand strategy (previous + friction through interaction with the rest of the world) – your overall presupposition about the behavior of the market, that could be influenced by political, economical, social, cultural and other macro environments. Why do you need long-term goals? This entry was posted in Business Management, Competence Training, Decision Making, Project Management, Tools and Techniques and tagged Business Management, Competence Training, Management, Organizational Change, Project management, Strategic Management, Strategy, Tools and Techniques by AnyaWorkSmart. Bookmark the permalink. This reminds me of my favourite saying from the military world as it applies to project management: no plan survives first contact with the enemy. PM lesson: plans need to be flexible to deal with changes driven from any level. Thx Mark, indeed so! This is why it’s so important to understand those levels and their interaction.